I am headed out of town with my family to speak at a women's retreat for Hope Community Church. They are traveling from their hometown, Cary, NC. We're all taking a road trip to North Myrtle Beach, SC to have some fun and learn about traveling with God and our girlfriends! I've been reading Max Lucado's book, Traveling Light, this week. It's based on Psalm 23. His main theme is how we need to release the burdens we were never intended to carry. I'll be sharing a message Sunday morning that is based on Psalm 23. 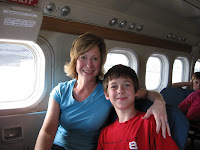 In it I share a few traveling tips I have learned along the way in the journey of my heart. Don't you just love how David describes God, our Shepherd? It's like he is trying to convince us that walking with God is like traveling in first class! Max Lucado writes his own paraphrase of Psalm 23 with a spin that reveals how God's children often live when we aren't walking with Him. seeking relief but never finding it. of death and fall apart. and I'm starting to act like my mother. and am surrounded by enemies. I go home and even my goldfish scowls at me. I anoint my head with extra-strength Tylenol. My Jack Daniel's runneth over. Oh, let it not be!!! There was a time in my life when those words pretty closely described my journey. My Jack Daniel's didn't runneth over but my Sun Country coolers did. I look back now and see that I drank to alcohol to numb the pain in my heart because nothing else would make it go away. Not a boyfriend, not accomplishments, not losing weight, not even the new car my mom bought me after I totaled my first one. Nothing!!! It wasn't until I ran into the arms of my Shepherd and let Him fill my heart with His love, acceptance, peace and forgiveness that I felt freedom. It wasn't until I took His hand and chose to trust His heart that I found my way Home. Well, I better get packed to go. Here is one of my favorite verse that encourages me to walk with God each day. 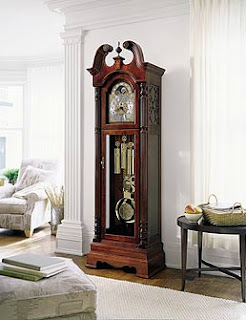 The ticking of the grandfather clock grew louder as the room emptied. I became more and more aware of each passing minute as people left to go home. Only moments earlier the room had been full of friends and old Ben was merely an unnoticed guest. But as the people departed and their voices with them, the sound of the clock caught my attention. Much like the ticking of that clock, God speaks to us, but often we don’t notice His voice amidst the shouts of our high-octane schedules and jammed “to do” lists. It’s not until we quiet ourselves that we can hear Him speak. Choose time alone each day - Set fifteen minutes aside each morning to begin your day with God. As your relationship grows, increase your time together. Create a setting for two - Find a comfortable quiet place for your time with God. I have a favorite chair near a window in my bedroom with a pretty chenille throw over it. Every time I walk by I imagine Jesus waiting there for me. Prepare your heart - Listen to a worship song to set your focus on God. This helps get our thoughts off all we need to be doing. Music reminds us of Who God is and prepares our hearts to hear from Him. Ask God to speak to you – Everything God wants you to know is written in the Bible, His love letter to you. As you read ask Him to show you what you need that day. If you don't know where to start, try reading one chapter in the book of John each day or a Psalm and a Proverb each day. Pray - This is your chance to listen quietly and share openly with God. There’s nothing you can tell him that He doesn’t already know; nothing too big or small for Him to handle. Remember – Journaling is like keeping a spiritual scrapbook. Record prayers asked and answered so you can see not only how God can changes your circumstances, but how He changes you! I had been pretty well-behaved when it came to listening to God in the big things - the ones everyone could see. It was when God called me to obedience behind the scenes - in my home, in my car and in my attitude - that I was challenged the most. For instance, a few weeks after my commitment to live in the "hear and now," I noticed my husband's side of the closet was disheveled. God reminded me that J.J. enjoys things being orderly, although it's not his natural inclination. I remembered how frazzled he seemed the day before. Then I heard God's voice, "One way you could really love J.J. and bring peace to his world would be to reorganize his side of the closet." My response: "He's a grown man; he can organize his own side of the closet. I have two kids and myself to keep up with." God's Spirit nudged me: "Did you hear me? Are you going to obey me now?" Sometimes I saw my role as a wife and mother as "average" responsibilities - one-talent kind of assignments. Plenty of people have the same assignments, I thought. Without realizing it, I believed it wouldn't matter much if I were a little selfish, inconsiderate or impatient here and there. But God wanted my willingness in every area of my life - here and now. Why would God require absolute obedience? Because He wants us to trust Him. He knows that when we're obedient with ordinary assignments we can be trusted with extraordinary assignments. He says when we are faithful with the little things, He'll "put us in charge of many things" and give us a deeper joy than we have ever known. (Matthew 25:21) Author Beth Moore reminds us that "the answers God gives us in our tomorrows often flow from our faithful todays." God has been so patient as I learn to be faithful and trust Him in the big and little things. I've found that it's in my relationship with Him that I find the purpose and meaning I long for. Now my calling flows from my love for Him, not my need for fulfillment or the desire to be important in anyone's eyes but His. By the way, I reorganized J.J.'s side of the closet. I am almost sure I heard God chuckle and felt the warmth of His smile. May He smile on you today as you commit to live in the here and now - acting on what you hear and living it out now. Lord, when You look at the assignments You have given me, do You find me faithful? Am I living and listening the way You want me to? I confess that I sometimes fall into the trap of waiting for a better tomorrow or an easier assignment so that I can be faithful. I want to live from the heart You gave me when I accepted Your Son's life in exchange for mine. I seek to have Your heart and be Your hands in my world today. In Jesus' Name, Amen. PS. So, is there an area of your life where God is calling you to be obedient? Does He want you to submit to your husband when you'd prefer to lead the way? Is God asking you to trust Him with your finances instead of working more hours? Do you hear Him calling you to forgive someone who has hurt you, or restore a relationship that is strained? I'm praying for you to trust Him and experience His peace and joy today. I write, then I disappear, then I write some more and disappear again. You might call it hide and seek. My husband and children might say we play it at home, too. Now they see me, now they don't! I am kind of an all or nothing girl. When I am preparing messages and in a busy season in my leadership role at the P31, I hide to seek Him and complete my assignments. Then in the afternoons, I come back out to play with my friends and family. I am trying really hard to find a balance. Maybe I need to pick a day to write on my blog and then I could be more consistent. If you have any suggestions as a seasoned blogger, I would love to hear them! So what have I been doing? The past few weeks have been filled with work, preparing messages, caring for my family and traveling. And now I've added some "bling" to my message this week! I just finished a new power point series tonight (actually this morning - it's 1:30am) for three sessions I am teaching this weekend in Henderson, NC. I don't usually do power point, but my friend Mandy offered to help me get started after I commented on her power points recently. 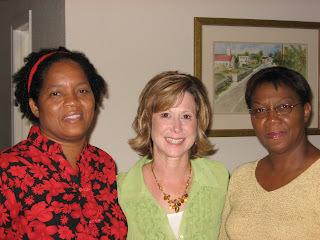 She and my friend Melanie spoke at a MOPs event last week and I went to hear them. It was great! This weekend I am doing my journey series for a church I spoke at two years ago so I developed two updated/new messages. The messages address two of our biggest roadblocks: comparison and control. Do you ever struggle with those. My deepest desire is to be a women who is totally content in Whose I am and who I am and what I have in any season. I can tell you that for me comparing and controlling eliminate any hopes of ever being content! It's not a stretch at all for me to come up with personal stories about these topics. Thanks for not giving up on reading my blog - even when I have long stretches of hiding. Your encouragement means a lot! (I did just post a devotion I wrote for P31 at HeBrews Faith Cafe) . I plan to write the next chapter in our love story next week. I was hoping to do that for our anniversary but you know where I was that week if you read my last blog. I love having friends like you from all over the world to walk this adventure with me. I'd treasure your prayers as I travel this weekend and my family heads in the other direction to go camping with 60 fathers and sons. JJ is planning that adventure, so he'd appreciate your prayers, too. Thanks my journey friend! Yes, I am still here! 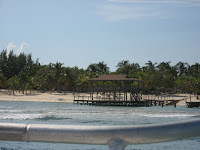 We got back from the Cayman's really late last Tuesday night . We were stuck in customs for over an hour in Charlotte. Then we ran to grandma's to pick up her favorite grand-dog Chelsea (our dashcund) that had been staying at her house. Her second favorite, Daisy (our beagle), was still at the kennel since we couldn't get to her in time. But I picked her up first thing Wednesday. I missed my poochies! I unpacked, did laundry, scrounged up some food and answered a gazillion emails Wednesday and Thursday I also got ready for radio recording Friday morning. I had 10 shows to finish writing and practice but with God's amazing grace and my wonderful production team, Jill and Marc, we had a great recording Friday. I saved some bloopers that I'll link as soon as Marc sends them to me. It's amazing what it takes to get one good show. Lots of laughs and effort! Then JJ and I packed up and took off for our anniversary weekend at the Cove in Asheville, NC where our friends Lysa and Art TerKeurst were speaking at a marriage retreat. Wow, it was incredible! 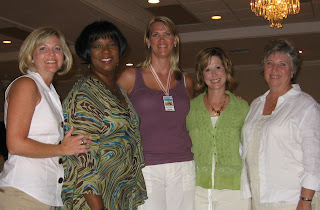 We had so much fun looking back over the past 14 years at all that God has done in us. We had a relaxing day Saturday walking on the trails and talking about our family signature - to love well (1 John 4:16). That is something Art and Lysa challenged us all to create. It was encouraging because JJ had already been working on something similar and it all fell into place for us. It's like we had the pieces and now we could put labels on them. That night Lysa and Art talked about "Great Sexpectations!" and we had a romantic evening implementing their suggestions! It was all going so wonderfully well....until I woke up at 3am NAUSEUS!!!!!! Oh my, could I be pregnant? It must be twins - I feel so sick. Nah, it couldn't happen that fast! Crazy what you think when you are sick and delirious! Well, I worshiped the porcelain throne from 3:30 - 10:30am at half hour intervals. Oh, how romantic. I have never been so sick! JJ was the sweetest prince trying to rescue me in my misery. Check out time was at 11am but he made arrangements for us to stay until 2:30pm when I was willing to take a risk and get in our car for the 2hour drive home. Poor thing had to listen to me moan and groan most of the way back. He even kept the radio off so I could sleep. I say we need a do-over for our anniversary, ya think? Well, we're home and we're settled in and I am finally feeling normal again. Who knows what hit me! JJ never got sick and we didn't hear of anyone else who got sick either. I am so thankful I didn't get sick until the end of the weekend. It wasn't my plan but I trust God's plans for us. He sure did give my sweet husband the chance to live out loud the very things he was hearing this weekend about lovin' sacrificially! You're my greatest gift after Jesus, honey - love you! 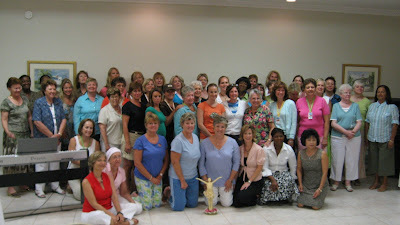 This post is for all of my Cayman Brac girlfriends who went home today. I miss you already! My day started with a prayer for you as I listened to your plane take off the runway outside of my window. Our family enjoyed a beautiful day on the beach and at the pool, but it was so quiet and empty without you! Not seeing your smiles as I passed through the dining room was so sad! Didn't we have such an amazing weekend - snorkeling, hanging out in hammoks, dodging hermit crabs, touring the island by land and sea, having high tea, a fashion show and some seriously amazing worship time with Ms. Babbie and Charles! I passed by the burial site of our "baggage" and prayed that none of us would ever take back what we left on the Brac! Tonight as I got ready for bed, I started singing, "I'll be standing in the gap for you, know that someone s omewhere is praying for you, calling out your name, praying for your strength, I"ll be standing in the gap for you..."
I am praying for you and I anticipate with all my heart the amazing things God is going to do in your life as you become a women who listens to God, looks to Him for all that you long for, and follows after His heart with all of yours! Here a just a few of the memories I captured on my camera this weekend. I have some really neat ones Meggie took that I'll post when I get back home. If you have any to share, please email them to me. Also, I'd love to hear how God set you free through this weekend's retreat. So please post a comment with your thoughts, prayers and memories here on my blog if you want to! Headed out to sea with my new friends: BJ from the island, Deborah from Atlanta and Lucy from London! 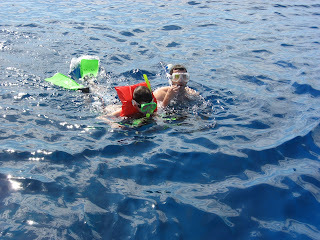 Andrew and I practicing our breathing before we go under! Who needs botox when you can just wear a snorkel! 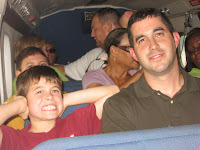 Joshua enjoying the ride on our way back to land. The boys and JJ went fishing early Saturday morning with "Mr. T" (Mr. Tibbets) whose family owns this resort and much of the land here on Cayman Brac and little Cayman. His grandson Kyle was assistant captain for the day. 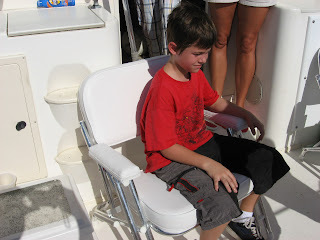 JJ said he was really great to hang out with so the boys could learn about boats and deep-sea fishing. 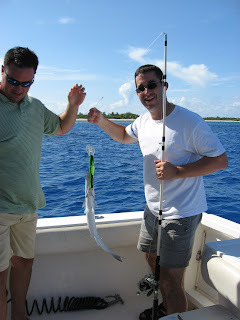 JJ was able to reel in a baracuda! 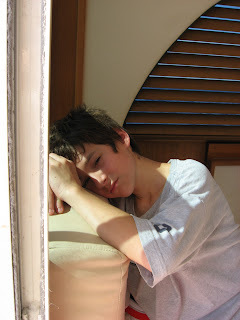 Joshua got a little sea sick! 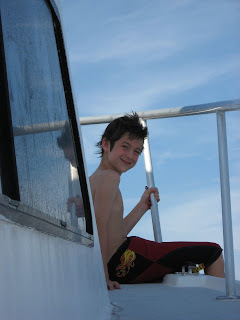 Andrew said that riding the waves was like riding a roller coaster - and he's not too crazy about roller coasters :-). When God called me to travel and speak I struggled with leaving my family on weekends. I didn't want to be away and I hated to fly. What if something happened to me and I didn't get to raise my children? What if something happened to them or my husband while I was gone? I shared these fears with my friend Marilyn who also traveled some with her husband in ministry. She e ncouraged me with these words, "Renee pray that God will bless your family in a way that would only be possible if you said yes to this calling on your lives." God has answered that prayer in amazing ways over the past several years, abundantly more than I could have imagined! This weekend, He has taken my breath away with His invitation to be here on the island of Cayman Brac speaking at the "Barefoot and Breaking Free" women's retreat hosted b y Mary Brandes, her retreat team and her family. I wish you could be here with us! 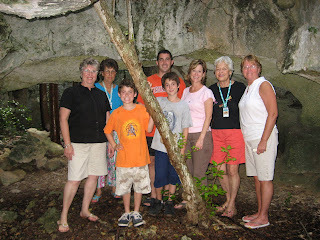 I want to remember each moment, each woman, each story, each adventure so I am going to indulge as I share our photos and our memories here on the Brac! 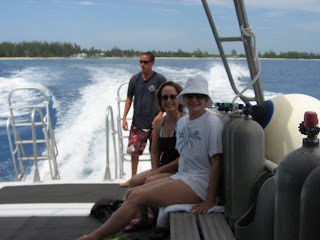 We left Charlotte on Thursday and traveled to Grand Cayman. When we arrived, we had to claim our bags and then go through customs. Then we checked everything in again and boarded a very tiny prop plane. 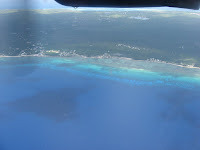 We enjoyed a breath-taking view of the ocean as we flew over the Carribean to Cayman Brac. The plane was so tiny that I could ask the pilot questions while we were flying. Well, I could if I wanted to but he couldn't hear me because propellars were right outside our windows! It was a little loud for Andrew! We arrived on the island of Cayman Brac Thursday afternoon and within an hour JJ and the boys were in the water learning how to snorkel. I was setting up my things and preparing for the women to arrive later. 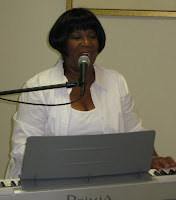 That evening we had dinner together and a short opening session with introductions to our worship leader - Babbie Mason, and our speaker - little ole' me! Babbie is an amazing woman full of heart and soul. 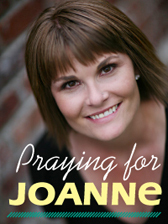 She's an award-winning songwriter and singer who reflects Jesus through her laughter, stories, words and songs. We are so honored to be serving in ministry with her and her husband, Charles, this weekend. They are so much fun. Friend, there are amazing things in store for us when we say "yes" to God! Hmm, my friend Lysa wrote a book about that! What is He asking of you today? Say yes, say yes! I am so glad I finally did. PS. 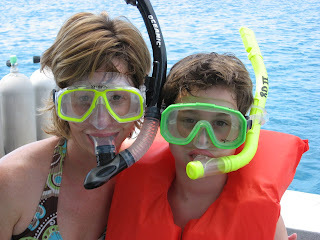 We went snorkeling on Friday and I posted some fun photos on my Faith Cafe site.